Automatic card shufflers are designed to shuffle Bridge (3.5” H x 2.25” W) and Poker (3.5” H x 2.5” W) -sized playing cards (Source). If you're dealing with an unorthodox-sized card deck, take some measurements prior to purchase to see how closely they adhere to the sizing requirements (Source). Electric card shufflers are good solutions to improve the speed and efficiency of card-playing- especially for large card games. Plus, if you or a loved one suffer from dexterity impairments, one of these shufflers can do all the card shuffling for them (Source). The Trademark Poker 4-deck shuffler has the largest capacity at 6 decks, while the Bryberry and Bicycle are the smallest, with 2 deck capacities. If you just want to shuffle one deck, you can split the deck in half. It's important to note, many buyers have complained about the poor quality of these units- there are reports of jams and durability issues. But it appears if you use the Trademark Poker shuffler carefully it can have a long lifespan. Buyers say that, while this is a pretty cheap-feeling shuffler, it does work well if you're careful with it. A reviewer we spoke with told us that after you've loaded your cards, you need to hold the shuffle lever down until the cards have run through, rather than intermittently pressing it. This helps to keep it from jamming. You will need to purchase some 4c batteries to power it- they're not included with the shuffler. 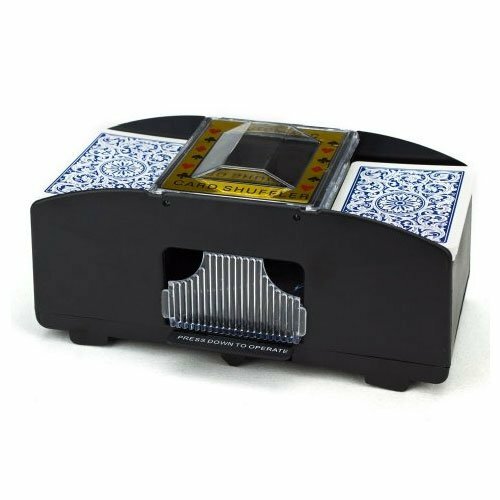 This automatic card shuffler offered by Trademark Poker is affordable, easy to use and an excellent choice both for amateurs or professional players. Users love that the device shifts six decks of cards for seconds, but some do note that there are no instructions. The Trademark Poker casino card shuffler measures 9” x 5“x 8”, and it’s suitable for standard-sized poker cards or narrow bridge-size cards. It runs on 4C batteries, which are not included in the package. To shuffle the cards, you only need to load half into the left side and half in the right and press the button. In general, users have a mixed opinion regarding the Trademark Poker automatic casino card shuffler, and they note some issues with the design. A happy buyer comments that the poker shuffler does its job fast, but he notes that the cards get stuck from time to time. Another satisfied client also shares that he has been using the card shuffler for four moths and that he doesn’t have any problems with it. On the other hand, an unhappy purchaser mentions that the Trademark device is cheaply made and that it worked slowly before stopping completely. Another user states that the design needs improving because the machine nicks the edges of the cards. A buyer adds that the poker shuffler didn’t work right out of the box, while another one states that it arrived damaged. 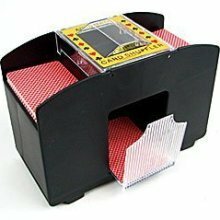 If you are searching for a way to shuffle your cards quickly, you might take a look at this 4-deck automatic card shuffler. Users love the price and the compact size, but some do note that the device is not very durable. 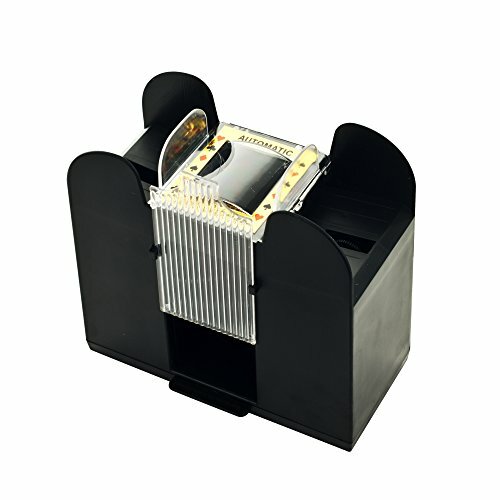 The automatic card shuffler features a removable plastic tray which is great because you can collect the cards quickly and a lever for quick shuffling. It’s suitable for up to four decks of poker or bridge cards, and it’s available in two colors – black and brown. To use this card shuffler, you’ll need four C batteries. As a whole, buyers don’t have a favorable opinion regarding the Trademark 4-deck card shuffler, and they agree that the quality is average at best. An unhappy user mentions that the cards get jammed very often and that the device doesn’t shuffle them evenly. A buyer also notes that it’s hard to insert the batteries and that the shuffler machine damages the cards. A dissatisfied customer adds that it’s a struggle to use the poker card shuffler and that he doesn’t recommend it. On the other hand, a happy purchaser observes that the shuffler doesn’t have an issue with one deck, but sometimes cards will come flying out of it. A reviewer also says that he doesn’t have any complaints regarding the performance of the Trademark automatic shuffler and that he has been using it regularly for weeks. This casino deluxe automatic card shuffler offered by Laser Sports is fast, handy, and an excellent choice if you are tired of shuffling cards. Users love that they could use the shuffler for four decks, but some do note that some parts are plastic. The Laser Sports casino deluxe card shuffle features a fingertip control, and you need to press one button to start it. 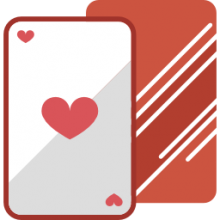 Another great thing about this casino card shuffling tool is that you can use it for poker or bridge card. It uses four C batteries, but you should know that they are not included in the package. A reviewer comments that the Laser Point shuffler is perfect for playing canasta and that in contrast with similar products, it has suffered no damage after a couple of months of extensive use. Another buyer also states that the automatic 4-deck shuffler works very quietly and that it doesn’t get jammed. He highly recommends it as the best casino deluxe shuffler. 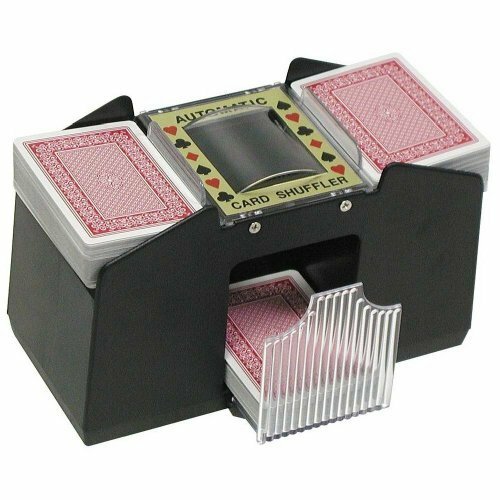 A user adds that she takes even greater pleasure in playing cards than before since she has this automatic card shuffler and that she recommends it for professional players. However, some customers have said that the 4-deck card shuffler isn’t very durable and that it the battery holder is poorly designed. Some also state that it’s not very easy to use it and that the cards get jammed. This automatic poker card shuffler offered by Brybelly is easy to use, handy, an excellent choice both for children and adults. Users love that the shuffler works fast, but some do note that it’s made in China and that it’s loud. The Brybelly card shuffler measures 8.4” x 4.5” x 4.2”, and you can use it to shuffle up two decks of playing cards – standard size. Another great thing about this device is that you only have to press one button to make it work. It’s suitable also for KEM and Copag cards, and you need four C batteries to use it. In general, users have a mixed opinion regarding the Brybelly two-deck automatic card shuffler. An online reviewer observes that the automatic shuffler for cards works great and that he has been using it regularly for months without any signs of malfunctioning. Another buyer comments that the shuffler mixes the card evenly and that the batteries last for several months. He adds that thanks to the automatic two-deck shuffler, any card game is more pleasant and fun to play. On the other hand, some unhappy purchasers have said that the device doesn’t work properly and that they have issues with the battery compartment. A reviewer states that it’s hard to find C batteries and that the cards get stuck from time to time. 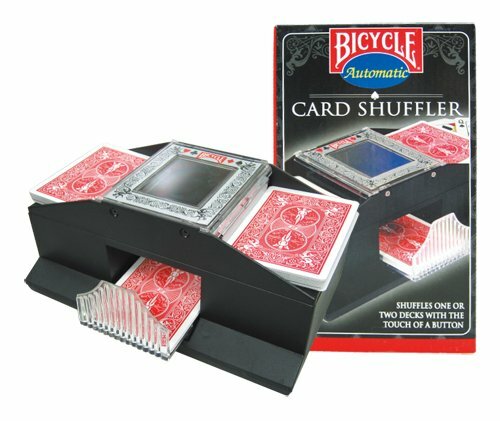 If you want a fast poker game and don’t want to bother with shuffling decks, you might take a look at this automatic card shuffler offered by Bicycle. Users love the price, but some do note that it’s loud. The Bicycle automatic device can shuffle one or two decks of cards at the same time. You just need to press the lever and then take your shuffled deck from the plastic tray. Another great thing about this product is that you can use it for bridge or poker size cards. Moreover, it uses four AA batteries, but they are not included in the package. A reviewer comments that the two deck shuffler worked exceptionally well at the beginning, but it stopped working after a couple of weeks. Another unhappy buyer states that the machine failed to work right out of the box and that it’s made of cheap plastic. A user adds that he expected better quality from the Bicycle brand and that the shuffler he received wasn’t brand new. On the other hand, a happy reviewer mentions that he used the two-deck shuffler two times a week and that he is very pleased with its performance. Another purchaser says that the machine does get stuck from time to time, but it’s not a big issue for him since it shuffles the cards very well. The first professional card shuffler we examined was the Trademark Poker six deck automatic card shuffler- it's marketed as a battery powered option that can handle up to six card decks at a time. The manufacturers say that it is a solid gift idea for the poker player in your family, emphasizing how easy it is to use, merely pressing the lever will instantly and comprehensively shuffle cards. This can be a good solution for people who are elderly, disabled or suffer from arthritis that makes dexterous card shuffling difficult. In addition, since card shuffling can take up a lot of time, doing it automatically with this shuffling machine can speed up game progress and efficiency. The way card shuffler machines work, you just need to load half of the cards into the right side of the rack and half of the cards into the left, push a button and a couple of seconds they are all shuffled and prepared to be dealt. They work best with traditional-sized playing cards that are 3.5" x 2.5", while bridge cards that measure 3.5" x 2.25" can also potentially work with this card shuffler. One buyer testifies that it does work for Magic The Gathering cards- so if you're looking for a Magic automatic card shuffler it should work. Another buyer who plays a variety of different table-based card games says that his family is large so the deck of cards can swell to over 500- that's where purchasing a professional-quality shuffling machine became an efficient solution. One canasta player says that sometimes you have to do a little bit of a manual tinkering before the cards will auto feed. A Cards Against Humanity player tells us that it handles six decks of cards at a time with relative ease. The second option we examined was the Trademark Poker automatic card shuffler- it is a battery-powered option with a six deck capacity. This option has received mixed feedback from its user base, with one canasta player criticizing it's shuffling action, saying that cards frequently got stuck and the battery compartment broke. Other buyers were frustrated and opted instead to purchase a hand-cranked card shuffler because the auto feed frequently jams. The third automatic card shuffler we examined was the Laser Sports casino option- it boasts fingertip control for a fast and complete shuffle. They have marketed this electric card shuffler towards rummy, canasta, gin, poker and blackjack players. It can work with one deck at a time and it is powered by 4C batteries. One reviewer purchased it as a gift for an elderly uncle that enjoys playing poker with his friends once a week. He says that it is a quiet option that has proven to be durable without suffering jamming issues that many other models do. An elderly married couple who frequently travel upstate to wooded areas without Internet connection says that to pass the time they play cards and have found that the shuffler was a fun and efficient way to improve the quality of their card-playing experience. Another buyer that had suffered a stroke resulting in impairment of his finger dexterity found that shuffling cards became impossible. This automatic solution was ideal for him to continue pursuing his poker passion. The fourth option we examined was the two deck BryBelly auto shuffler. Skimming their promotional materials, they've marketed this as an ideal solution for children, the elderly, and for large groups that want to speed up card games like Uno and poker. One reviewer says it works with any brand of card as long as it is poker or bridge-sized, including Bicycle. The way it works, if you were using one deck at a time and you just need to split it between the two sides, perform the finger press, and witness the fast and automatic shuffling. There have been some complaints with this option, with reviewers criticizing the battery spring, sporadic operation, and its general durability. The last option we examined was the Bicycle card shuffler- it can handle one or two decks and works with poker or bridge-sized cards, powered by four AA batteries. It employs an every other card shuffler pattern. Again, this particular option has received mixed feedback from its user base, with buyers criticizing the quality of the shuffle, saying that it wasn't completely random. In addition, poker players say that the plastic build feels cheap, it's noisy and suffers from jams.